AAWR preserves the art and legacies of Archived Artists, each of whom are recognized as significant Ohio artists. The organization is home to several thousand works of art created by accomplished artists who found the urban, suburban, and rural environments of Ohio conducive to the development and execution of their artistic visions. Upon acceptance as an Archived Artist, each artist is asked to donate a representative body of work to AAWR which is then preserved, cataloged and made available for study by art historians and other academics. The AAWR collection encompasses a variety of media including paintings, photographs, sculpture and textiles. The collection is kept in a controlled environment that offers protection from fire, theft, mishandling and extremes of light, temperature and humidity. 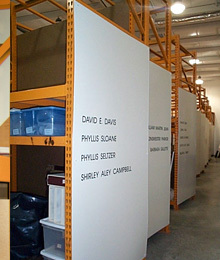 Artists also have the option to rent storage space for other works in this controlled environment. Contact AAWR for additional information on how you can become an archived artist, or call us at 216/721-9020 to schedule a viewing appointment.